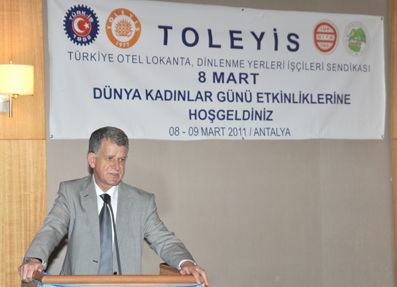 Trade Union of Toleyis performed the activities of 8 March International Womens Day in Hotel Lykia World Antalya between the dates of 8 March and 10 March 2010. More than one hundred women members from the organized companies of Toleyis experienced the happiness of coming together at International Womens Day. At the opening ceremony of the meeting Mr. Cemail Bakindi, President of Trade Union Toleyis who is president of Eurasia Federation at the same time, pointed that womens success in being organized and they should occupy more places in organs and activities of trade union also. On this occasion, President Bakindi gave gifts to women participants as a symbol of memories on this event, because this event is needed to be turning point in trade union movement and place of women in them. Mr. Sayim Yorgun presented the theme Place of Women in Trade Union Movement. In the beginning of his presentation, he spoke about matriarchal history and its transmission in male dominated system and also point of womens role in this process. According to Mr. Yorgun in this century, female labor force will be an increase. Mr. Yorgun accentuated that in collective agreements of trade unions need to find article about nursery how women can take active and heavy role in trade union movement and trade union activities also. He recommended to opening of Committee of Women in trade union whose activities and events will be more effective in trade union movement. Second day of this very important event in trade union movement and role of the women Ms. Canan Özcan - responsible for international affairs of Toleyis Union presented the theme  International Trade Union Movement and Women Workers. By touching of historical background of 8 March International Womens day, she accentuated position of women in process of globalization and illegal work at most pronouncedly in women labor force. Specially she accentuated more necessary of organization women in trade union and more role of the women in trade unions. Also, on the meeting Ms. Emina Karo  responsible for office of Balkan countries by Eurasia Federation presented the theme  Role of the Women in Trade Union, Politic and Position at the Work Place in South  West Europe and Eurasia Federation. She emphasized that in South  West Europe of trade unions number of women is not enough but in compared with Turkey that number is bigger, but in this area women must have more bigger and activity role and place not just in trade union also in politic and all of segments by public life. Ms. Filiz Aktas  representative of Trade union of Toleyis by SWISS hotel Istanbul and she is also sole amateur administrator woman in union spoke about problems in front of women in work place, she accentuated that women must work more and to struggle for itself and their rights, and easiest way for the active role of the women in trade union. Derya Aydogan member of Toleyis trade union, also worker in ÇIRAGAN PALACE KEMPINSKI from Istanbul thanked organizers of this trade union event and suggested these kind of activities of trade union continue in future with accent for foundation Section of women by Toleyis trade union. Ms. Nurcan Özdemir Sen worker of Lykia World Antalia accentuated problems of women and discrimination in work place, especially role of women as a mother and that is necessary to help women with nursery expenses covering by employers. In the end of trade union event Mr. Cemail Bakindi  president of Toleyis trade union and Eurasia Federation accentuated his happiness because of this event and gave certificates to all women participants with president of Regions of Toleyis trade union.